Overnight leaders Andrew Hill and Shaun-Nick Bester put the hammer down from the start to surge to stage and overall victory on the final day of the PwC Great Zuurberg Trek mountain-bike race at Addo today. The TIB-Silverback-Best4Sport team won their second stage of the three-day event at the Zuurberg Mountain Village just outside Port Elizabeth to take the title in 8:53:46. After a sluggish start to the event, RSA Web’s Stuart Marais and Renay Groustra placed second on today’s 50km stage to rise to fourth in the general classification. Yesterday’s winners, Aiden Connelly and Rogan Smart (Bike Shop-Scott-Strocam), placed third to keep their second place in the standings in 9:02:05. East London’s Jason Peach and Jason Reed were fourth today to place third overall in 9:05:55. The women’s race was won by Ascendis Health-Spur’s Ariane Luthi and Robyn de Groot, who dominated the event from start to finish to relegate the experienced Theresa Ralph and Sarah Hill (Galileo Risk) into a distant second. It was the Durban-based Hill’s third triumph in four years after back-to-back titles in 2015 and 2016, while Bester, from Pretoria, was making his debut in the tough Eastern Cape race. The outcome represented a remarkable comeback by Hill and Bester after a serious mechanical on Saturday saw them lose all but two seconds of their nine-minute advantage. “It really was something of a miracle because we were able to secure the bolt we needed to fix Andrew’s problem from another rider who had also suffered a mechanical,” said Bester, who turned to mountain biking this season after a stint on the road in Europe. “After that delay, we never thought we would keep our lead but we just went as hard as we could from then on. “Saturday’s problem meant we were still stressing quite a bit for today’s stage and hoping that we would not have any further problems. “From the start, we decided just to ride as hard as possible to try to build up a lead in case anything went wrong. 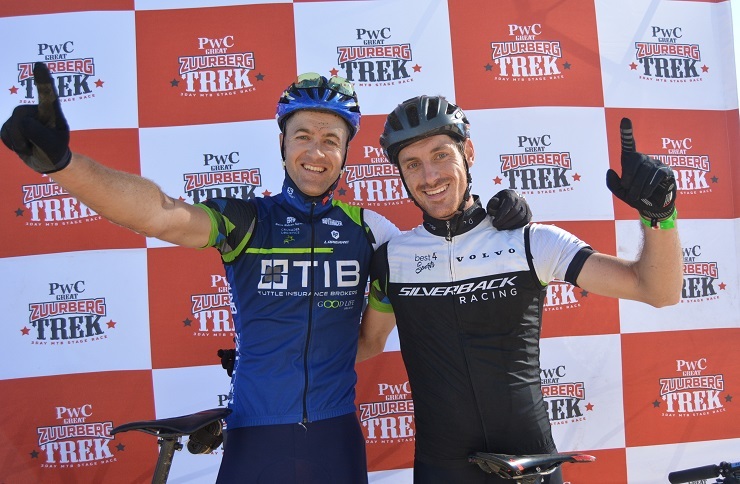 Bester said he had enjoyed his debut at the PwC Great Zuurberg Trek. “The routes were great, with some excellent single-track sections and today the Hayterdale trails were really cool. Luthi was also delighted with her maiden event, especially after she had doubts about entering because of her limited time in SA. Although she lives in Stellenbosch, she races in Europe during their summer and returns tomorrow to continue her preparations for the UCI MTB World Marathon Championship in Italy in September. “I was only back for two weeks, but as it turns out this was a really worthwhile exercise and a true African experience. She said she had a really good connection with De Groot, a five-time national marathon champion. Silverback Bikes’ defending champions Neill Ungerer and Yolande de Villiers completed a hat-trick of stage wins to take the mixed title for a second consecutive year in 9:21:39. Garmin’s Ben Melt Swanepoel and Yolandi du Toit, followed by Nicholas Webb and Kylie Hanekom, completed the podium.